Welcome back to the two-part tutorial ambiguously titled Drafting By Feel! 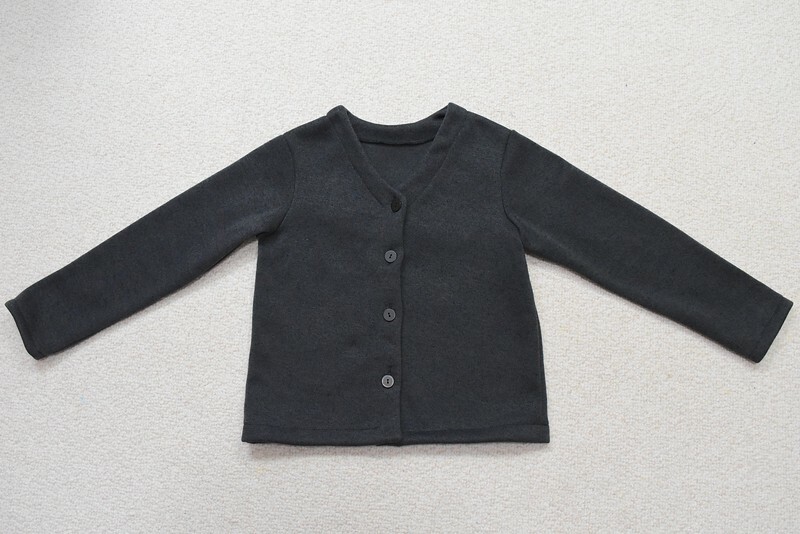 In Part 1, we discussed (in meandering detail) the armhole of Jenna's Halloween cardigan. Today, we'll be discussing sleeve caps. 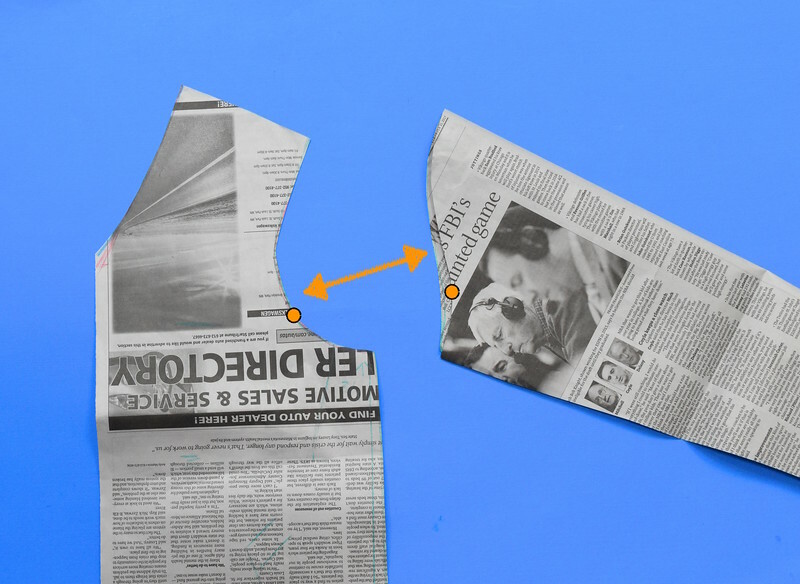 The aim of this tutorial is to demonstrate how I visualized a sleeve for Jenna's cardigan and translated that into a paper pattern. Quick recap: this is the finished cardigan. 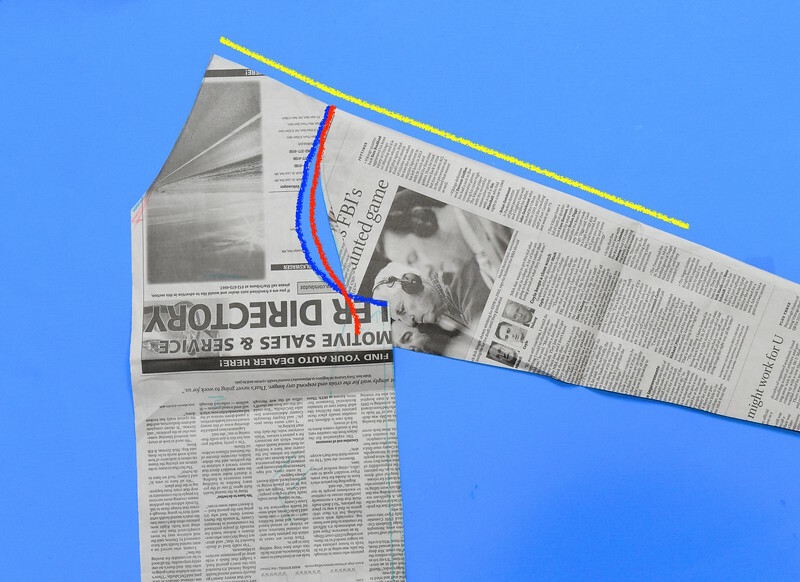 Note that the sleeves stick out rather than hang vertically from the shoulder - we discussed in this post that sleeves which are set closer to the horizontal level tend to allow more freedom of movement and are subsequently more comfortable. I like comparing-and-contrasting as a way to further define what we're talking about, so let's take a quick detour and do that here. 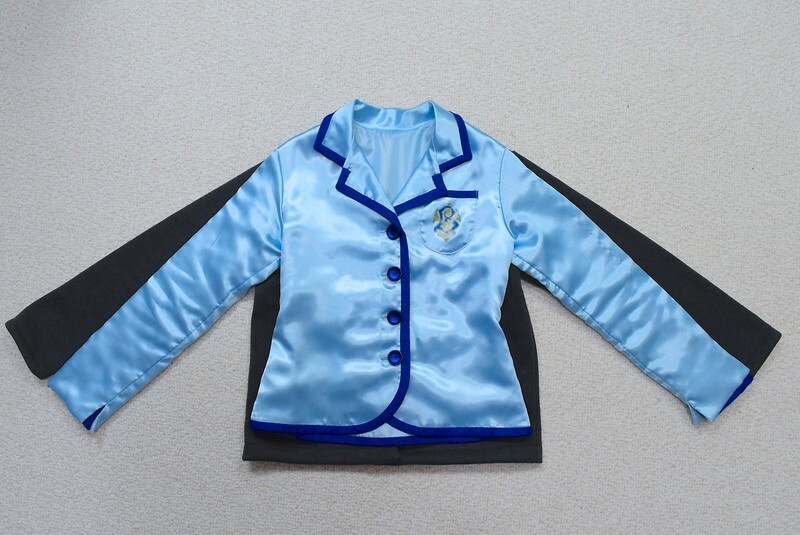 Here is that 2016 Beauxbaton blazer superimposed on the cardigan - the sleeves of the blazer are set more vertically than the cardigan's. This produces sleeker lines at the shoulder and armhole of the finished garment but not as much comfort during movement. 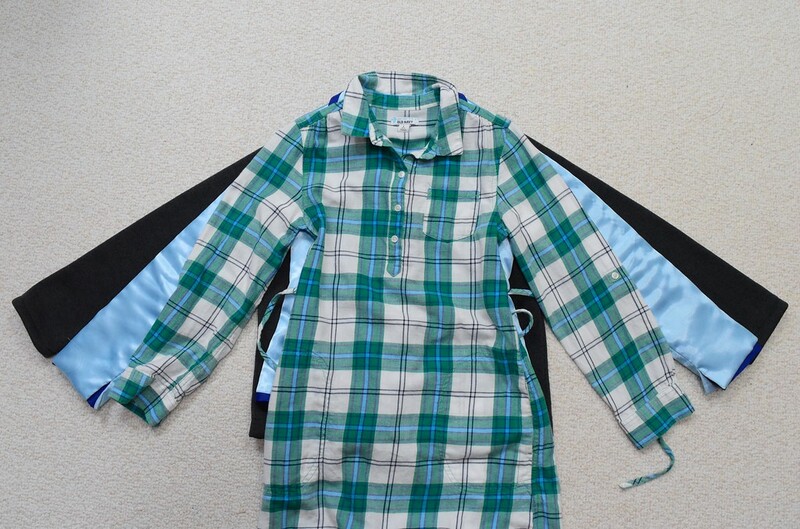 Compare these now to a RTW woven shirt from Old Navy, whose armholes also happen to be smaller (understandably so, given that it's a first-layer shirt and not a second-layer overgarment). The sleeves of this RTW shirt hang more vertically than either of the handmade garments. When worn, the sleeve of the RTW shirt will probably look the sleekest, particularly on models in a catalogue, but it is the least comfortable should those models choose to actually raise their arms. If you've tried on RTW shirts in fitting rooms that looked great on the rack, only to find your arms feel like they've been trussed up about your shoulders, now you know why. Pencil-thin consumers could possibly feel a decent level of comfort in sleeves like these, but the vast majority of us have real arms, and these sleeves, while perfect for posing, are not as practical for actual moving (or cartwheels, or anything else that is part of a child's typical range of movement). End of detour. 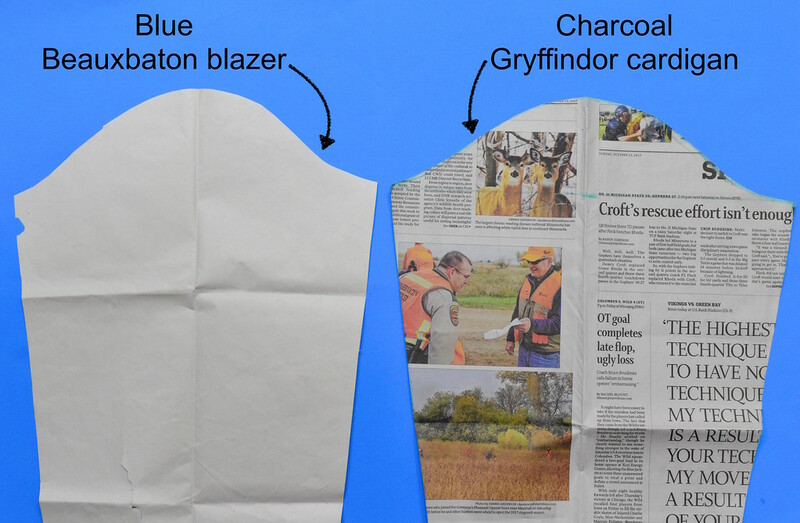 Let's return to handmade now, to the sleeve caps of those two handmade garments - the 2016 blazer's is on the left, and the 2017 cardigan's is on the right - and make two observations (actually, it's a Ravenclaw cardigan but I'm too lazy to make corrections to the photo; sorry, HP fans). 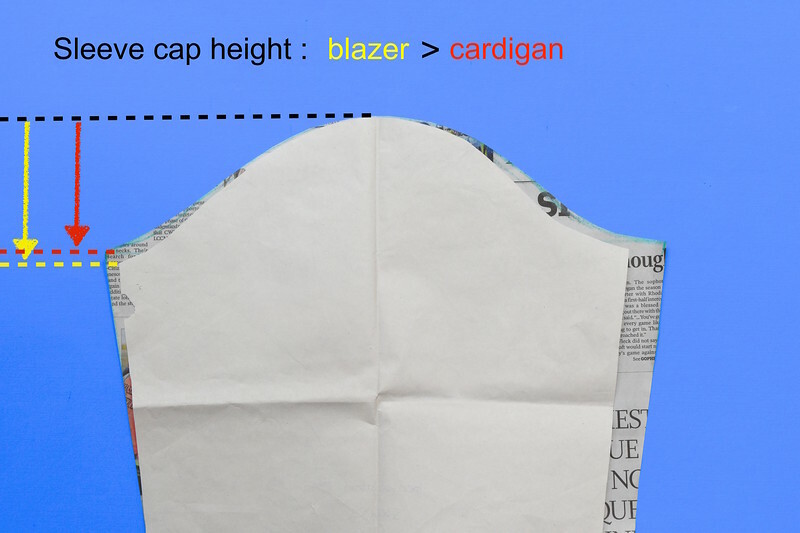 One, the blazer's sleeve cap is higher than the cardigan's. Not very much higher (we'll revisit this specific observation at the end of the chapter), but still some. Two, and more significantly, the blazer's sleeve cap is narrower than the cardigan's. 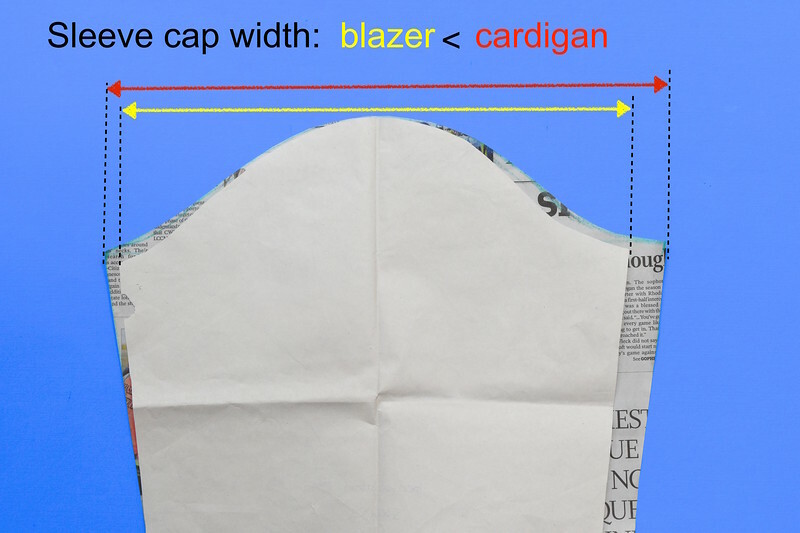 Taken together, these two dimensions - the width and height - shape the sleeve cap. In this example, they indicate that the blazer has a pointier/less flat sleeve cap than the cardigan. This is nothing new to us, because I have shared numerous diagrams and photos exactly like these, with identical accompanying conclusions, in previous drafting posts. What's new today is perhaps how I decided how flat/pointy/broad/wide to draw the cardigan sleeve cap, based on the kind of fit I visualized in my head. I'm going to introduce a new idea right here: PRIORITIES. This might be a word we don't see often in drafting terminology. When we first begin to draft, everything seems equally important. We feel like we need to measure every dimension of the body, draw lines that pass through every point on our draft, stick to every formula and instruction. Do not berate yourselves, friends, if this is your drafting method. We all begin to learn something by obeying. As we become a little more comfortable with drafting, we begin to see that these measurements and formulae are only a framework for obtaining a draft. 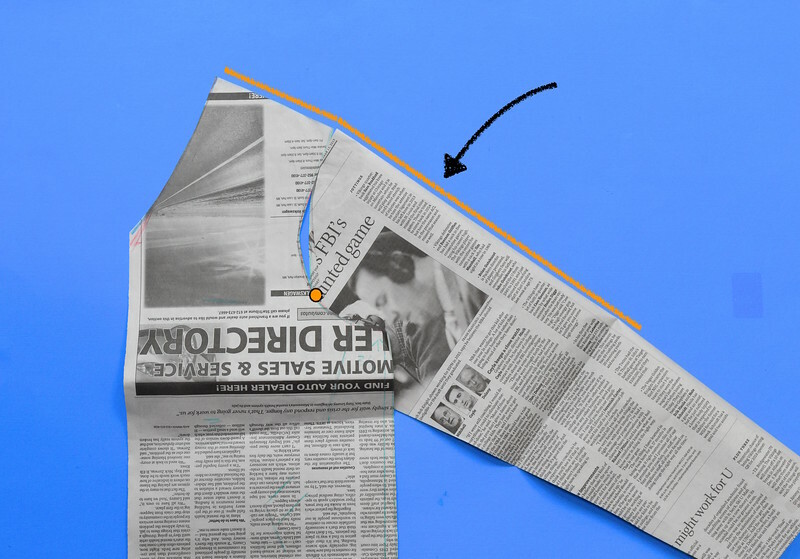 If we're feeling sufficiently reckless, we might even experiment a little: shift a dart, reduce an armhole, measure around the abdomen instead of the hips. The results of those experiments are not failures - they are still bona fide drafts, but now they fit a little differently than would have if we'd stuck to the formulae. "Oh," we say, "so that's what moving the dart up an inch does. Hm." It is a fortuitous learning moment. 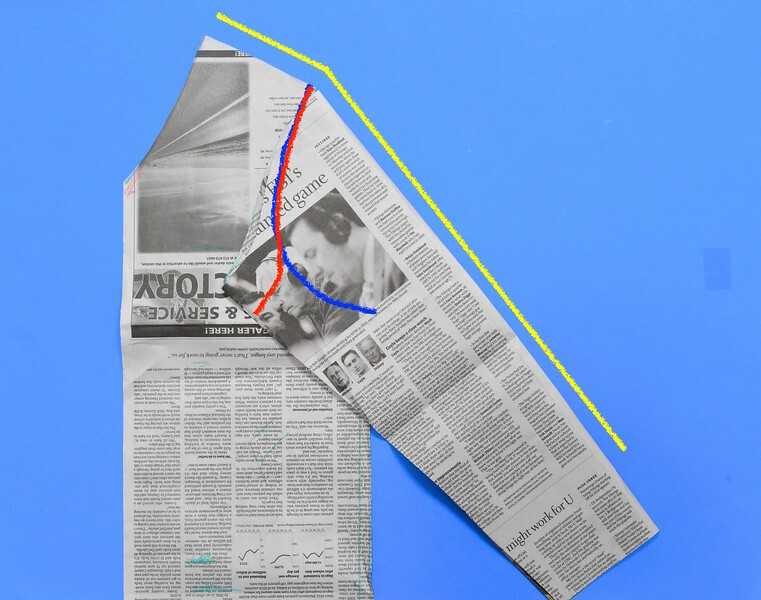 Now, what if you'd actually desired that alternative fit - the fuller bust, the more mobile sleeve, the blessed absence of drag lines along the side seam of a pencil skirt - and were able to factor that into your drafting from the beginning? It wouldn't be accidental, then, would it? 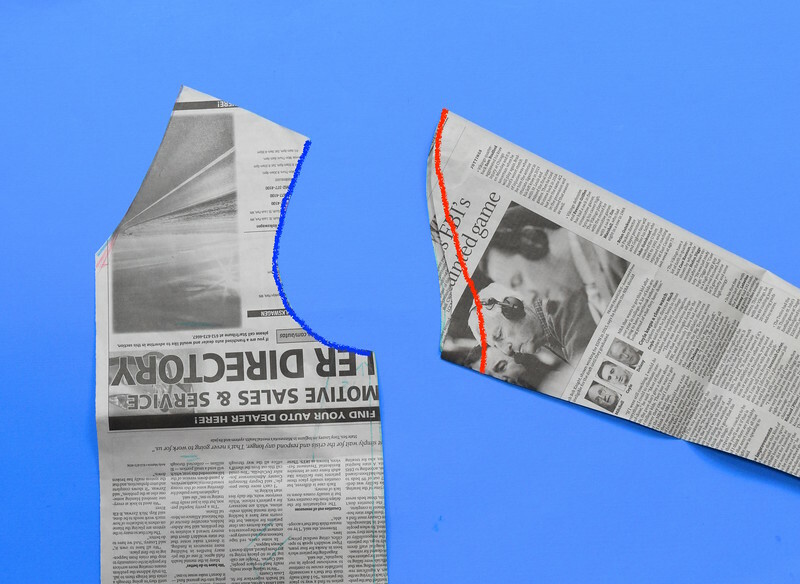 It would be a choice - something you prioritized (a smaller armhole) over something else (drafting the recommended armhole size according to the schema) toward a known end. We're going to prioritize in TWO stages. 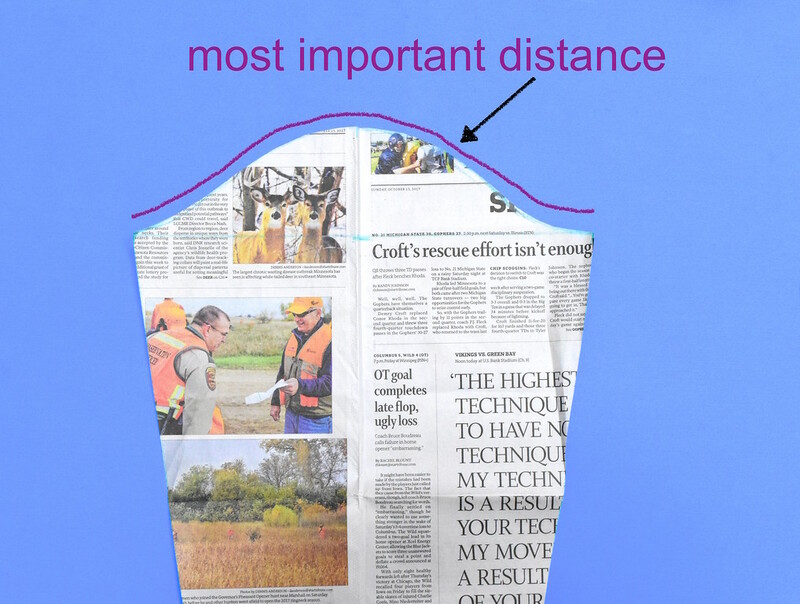 When we draft a sleeve cap, there are three distances that we use together. 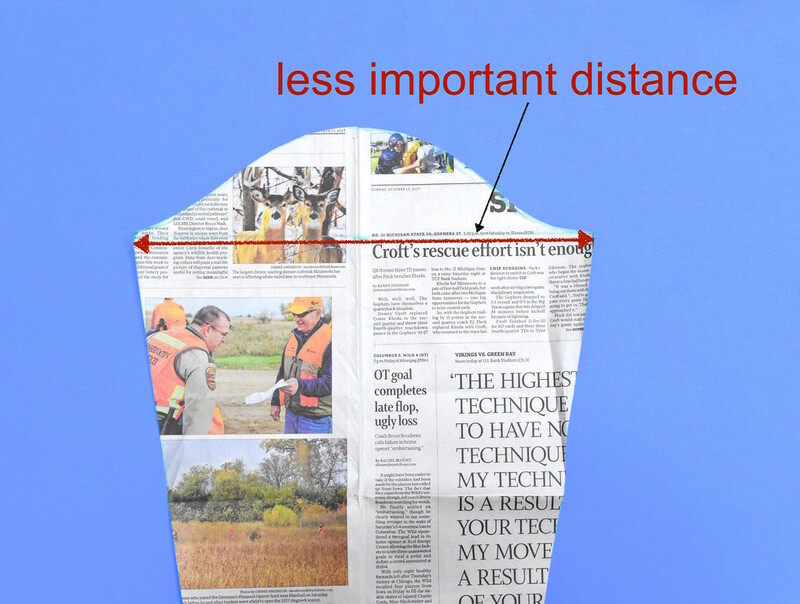 Because these three distances are interrelated, we usually obtain the final shape of our final sleeve cap by juggling and balancing these three distances. In the first stage, we prioritize the most important distance according to the ultimate goal of drafting a sleeve. 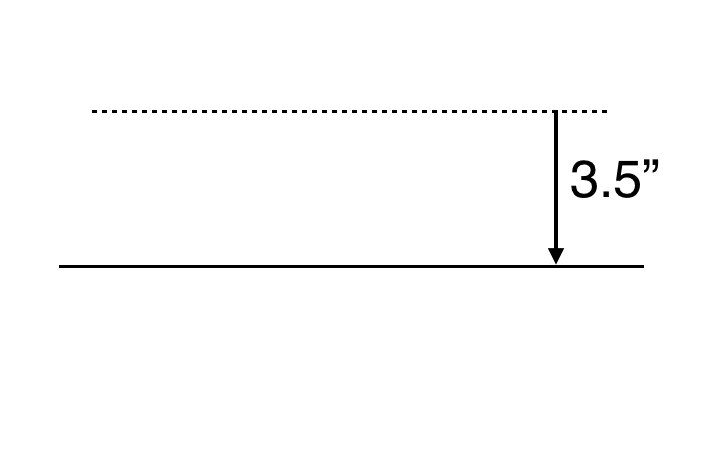 The first distance is the sleeve cap length. This is the most important distance in the entire sleeve draft. This is because it has to match the size of the armhole, and is thus -in a manner of speaking - non-negotiable. The next distance is the width of the sleeve cap. 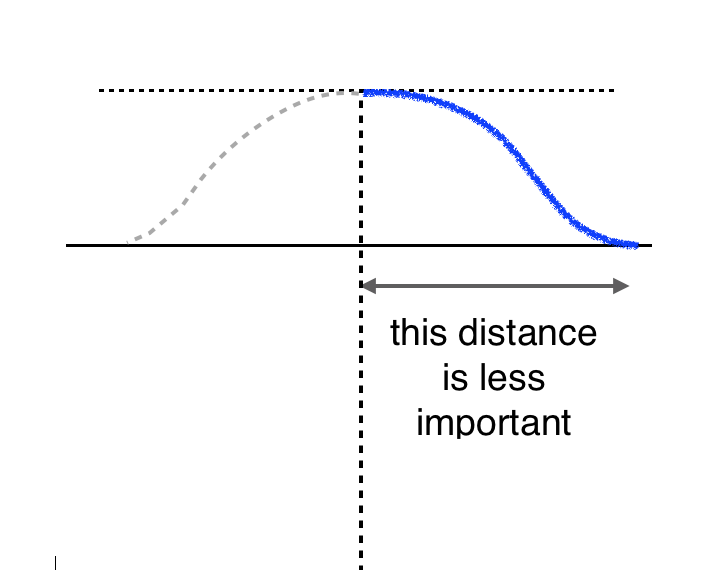 While this is a useful reference distance, it is less important. This means you can adjust it. 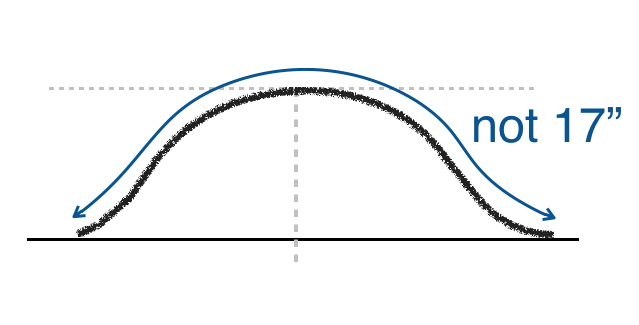 The third distance is the sleeve cap height. It partially determines the pointy-ness of the sleeve cap, and is thus important. However, it is also adjustable. Here, I want to gently expand the scope of your power as a drafting person: you have more control than you think. You are a shaper; you are not dictated by impotent numbers. What we're going to do today is draft a sleeve cap whose length matches the size of the armhole. Since the armhole is 17" around, we'll need a sleeve cap distance that's 17". Beyond this non-negotiable number, everything else is flexible. 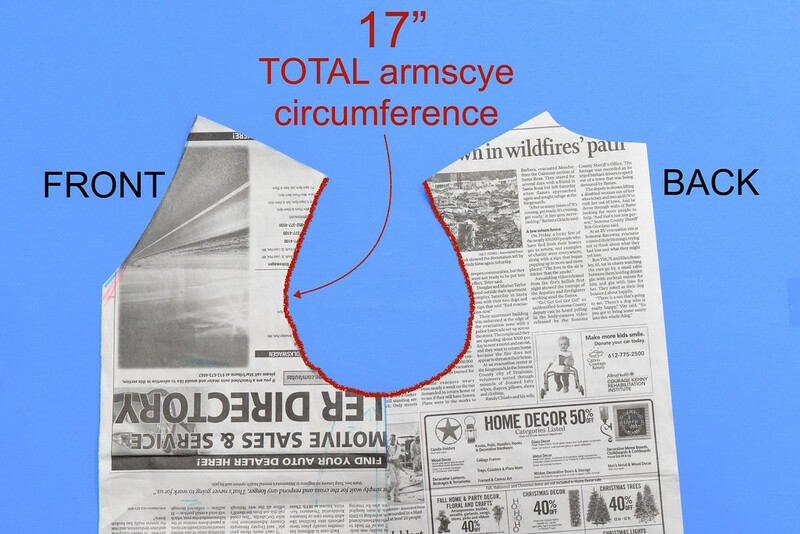 If we're feeling especially autonomous, we can simply freehand a 17"-long curvy line that's vaguely sleeve-cap-shaped. It will take us less than 10 seconds. This is essentially what I did when I drafted the sleeve cap for Jenna's cardigan. I'm going to reconstruct my thought sequence so you can follow along the visualization process with me. "I need to draw a sleeve cap. Half of it is the front and half of it is the back." "The finished sleeve cap must fit in the armhole I drew earlier." 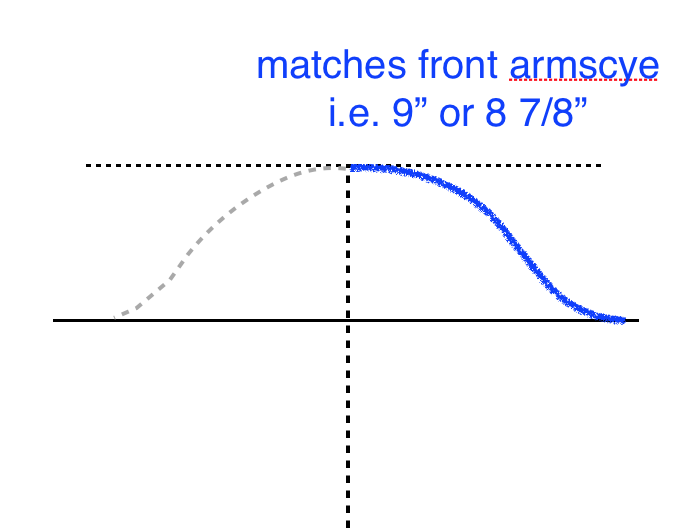 "The inflection point of the armscye will (roughly) match the inflection point of that half of the sleeve cap (i.e. front-to-front, back-to-back)." 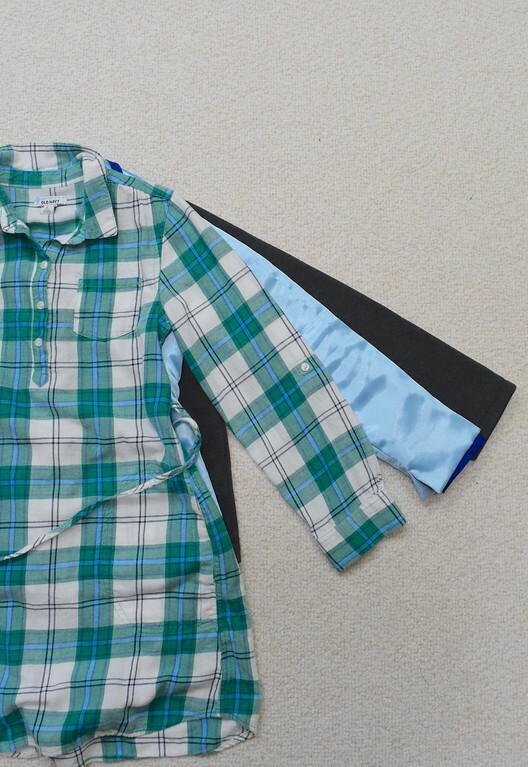 because that's what I envision the finished garment to look like - comfortable for arm movement." 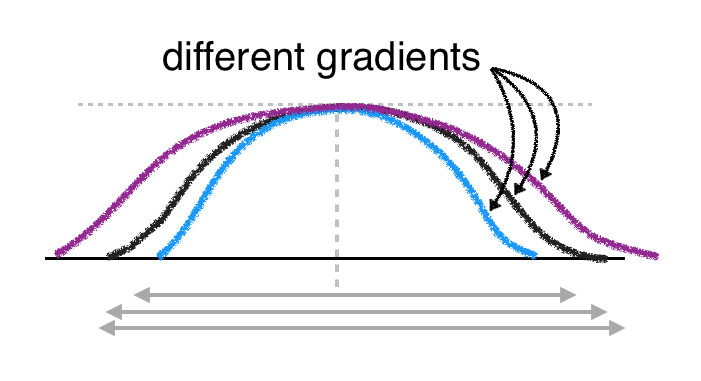 "Now what gradients should I assign to those sleeve cap curves? (i.e. 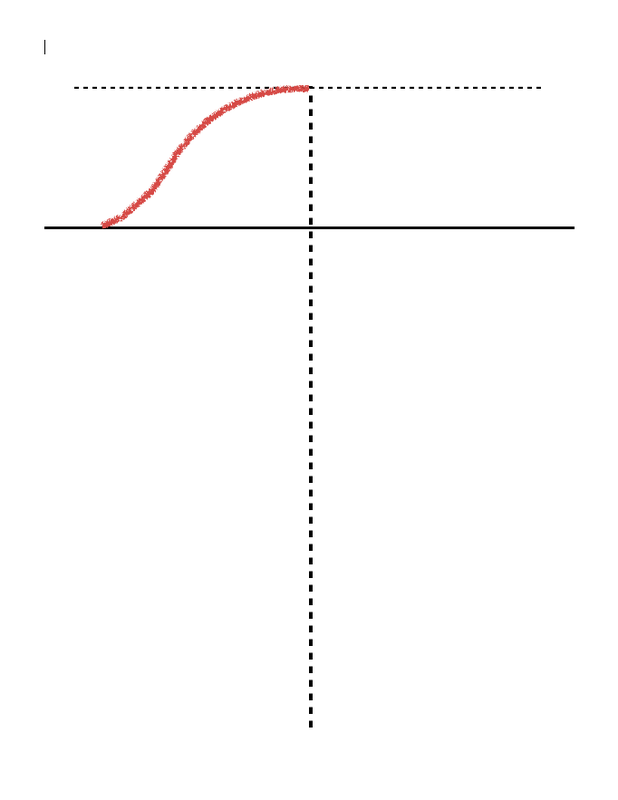 how steep should those mountain-looking slopes be?)? 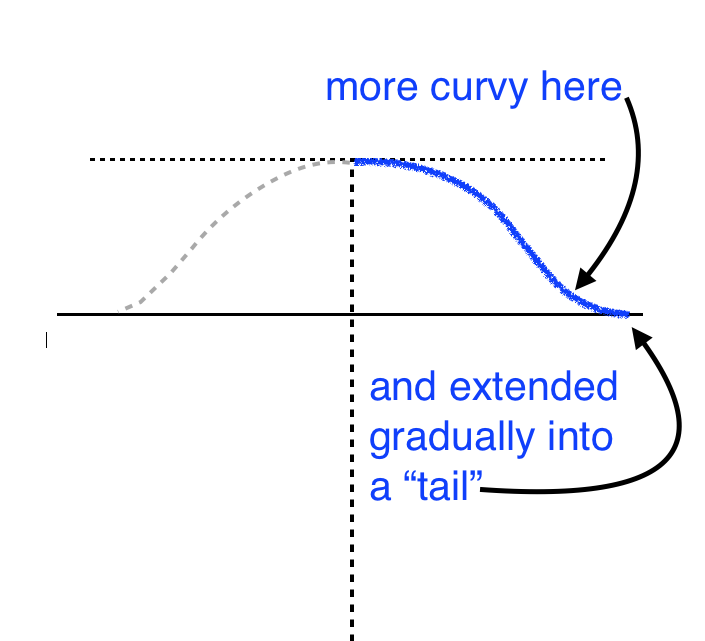 Let's imagine what I'll get if I have differently-sloped sleeve cap curves. the sleeve is going to hang more vertically. This is probably going to restrict movement. Jenna's going to want to wave her arms around a lot. So, no. the sleeve will be set far too close to the horizontal. It will be comfortable like a kaftan but there'll be excessive fabric pooling in the armpit area when the wearer's arms hang in their rest position. So, no go." "This is the shape that when set into the armhole, will produce sleeves that hang at the natural angle that I want." Now that I've visualized the shape of the sleeve cap, let's now take some reference measurements and walk through the drawing process. Note that I didn't actually need any of the following measurements to freehand a 17" curve, but they are useful for reference and checking. First, I measured Jenna's arm. I took two measurements. 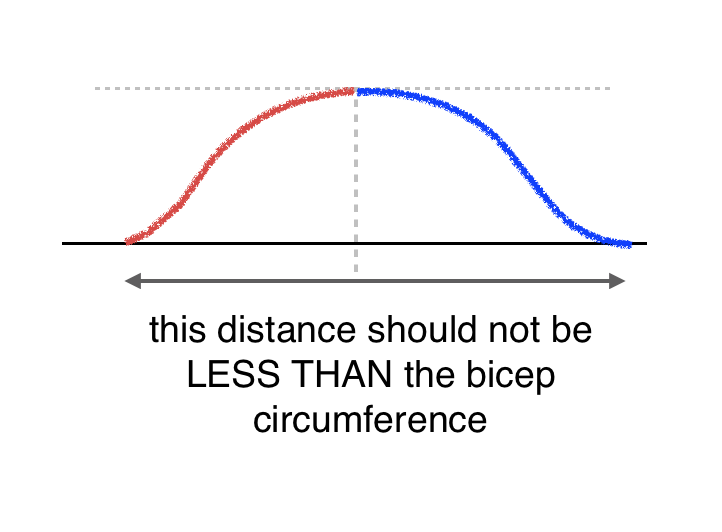 One was the circumference of her bicep. This would be the fullest part of her upper arm. Like the armhole measurement, I made a loop and adjusted its size for comfort. and located that on the measuring tape. This distance - 3.5" in this case - is the height of a sleeve cap that corresponds to the shape of Jenna's arm. If I'd let my fingers drop lower - to, say, 4.5", you can tell that that would not be the position of the fullest part (her bicep) of her upper arm. And if we were to create a sleeve cap that corresponds to this untrue position of her bicep, we'd get a pointier sleeve cap than would correspond to this arm. This in turn would result in an ill-fitting sleeve. Now we transfer all those numbers to paper. First, I draw a horizontal reference line at the top of the paper, and a second horizontal reference line 3.5" below that. 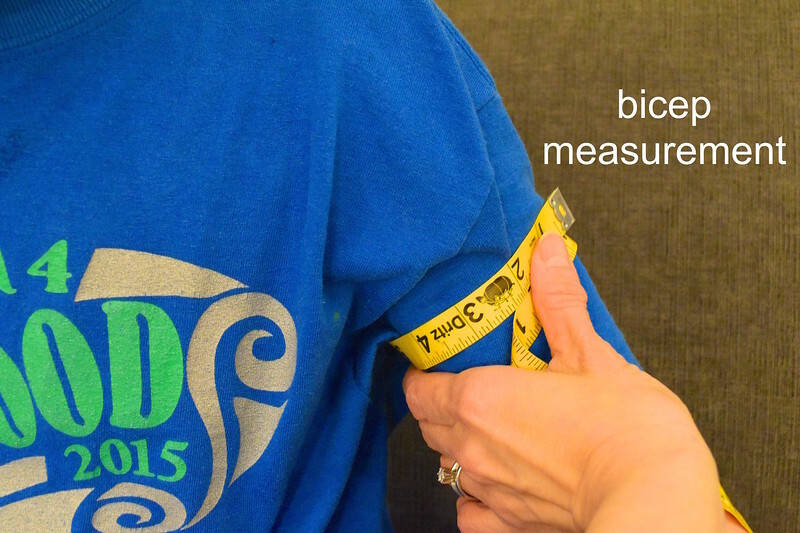 This separation is the height of the sleeve cap that we measured on Jenna's arm. 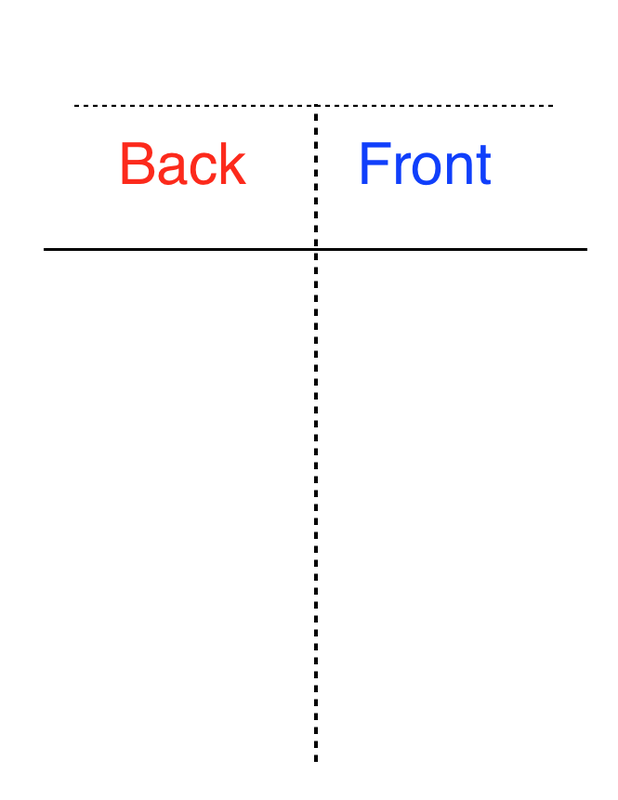 We are going to draw the sleeve cap between those two lines. and each of those half sleeve caps will match their respective half-armscyes in length. 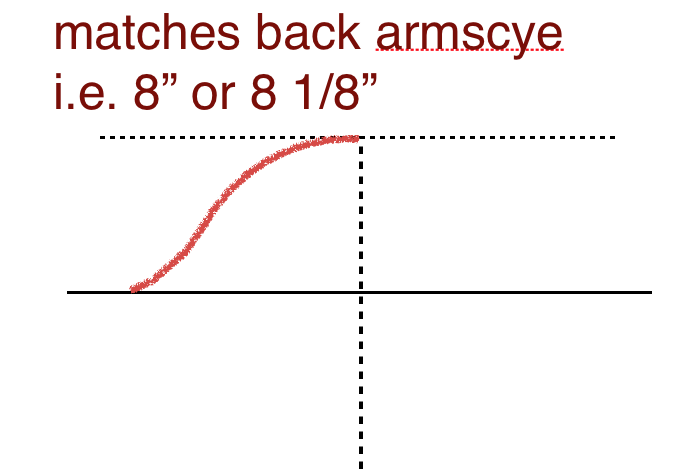 what's more important is that the length of that curved line matches the length of the back armscye of our bodice draft. We'll use a measuring tape - just lay it on its edge along the curve - to ascertain this. This process typically takes about 5 minutes, at the end of which we'll have a preliminary sleeve cap that matches the armhole, and whose height matches the bicep position on the wearer's arm. Finally, let's bring in that horizontal distance we've been so diligently ignoring. 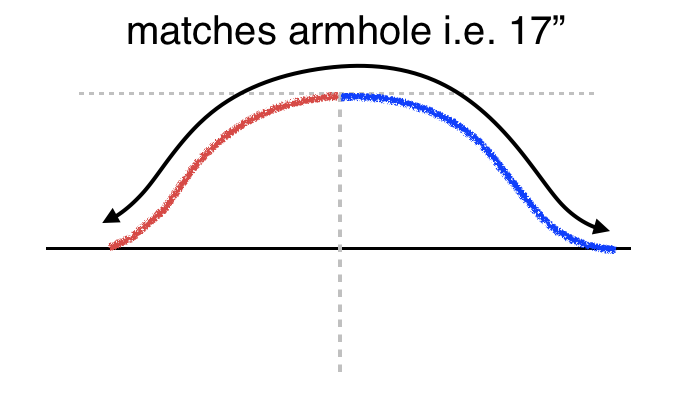 In typical sleeve drafts, this is the exact bicep circumference, and we fix it early in the drafting process and draw our sleeve cap curves in reference to it. 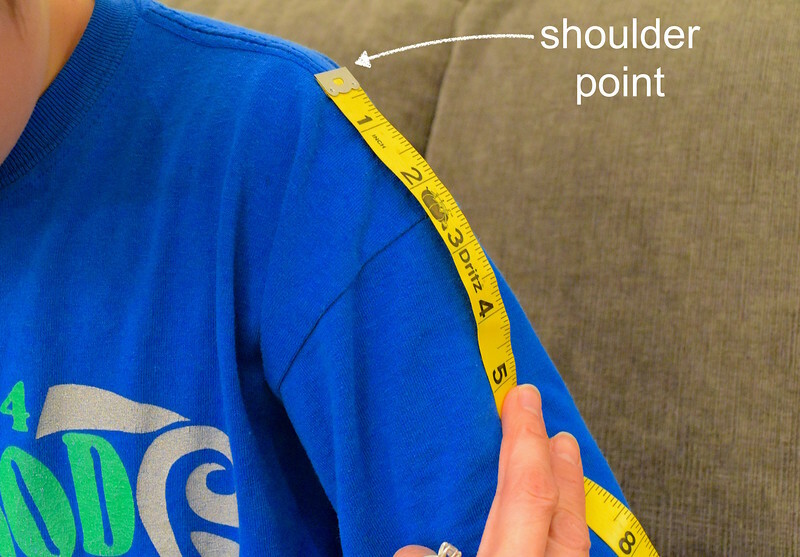 This often produces a snugly-fitting sleeve (at least around the bicep) with sleeve cap curves that soar high in order to match the length of the armscyes of the bodice. There's nothing wrong with this approach, incidentally. 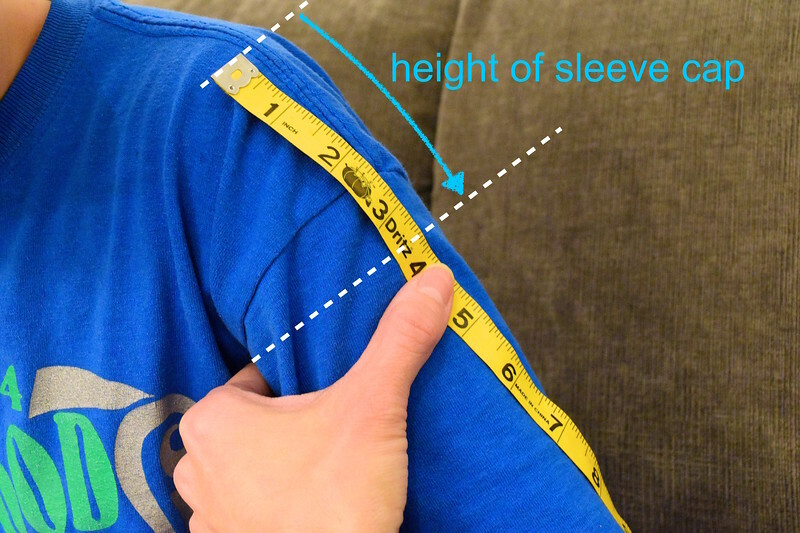 It's just another formula for producing a fitted sleeve - in this case, the priority is on creating a sleeve that's snug around the bicep and armpit. Remember, this kind of sleeve does look beautiful and sleek. Unfortunately, sometimes this profile is at the expense of comfort, particularly in fuller-armed wearers, who would experience peaking at the shoulder and pulling around the armpit when actually moving their arms. There are times when we would choose this profile - formalwear, for instance, when clean lines and sleek silhouettes are paramount. 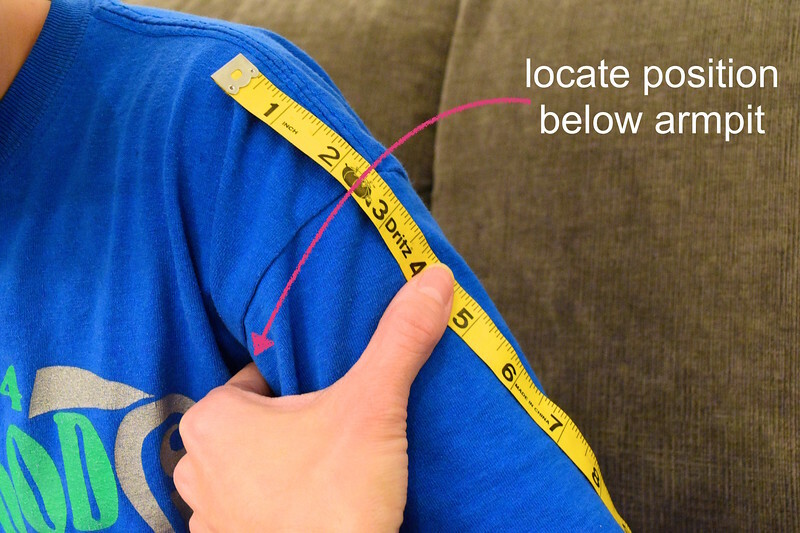 However, when I draft for children and individuals with fuller upper arms, and when I'm making garments for everyday wear in which comfort and freedom of movement are preferred over those sleek lines, I don't fix that bicep line. Instead I fix the height of the sleeve cap, and draft within the constraints it provides. What "gives", then, is the width of that horizontal bicep line. 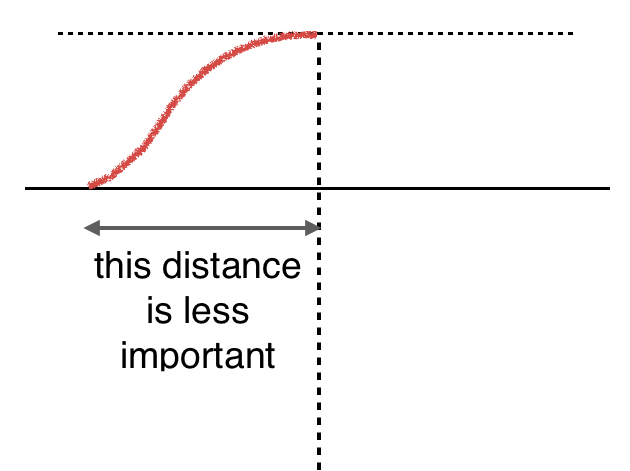 And here we make reference to that second stage of prioritizing: what factor is is of dominant importance in the shape of a sleeve cap? 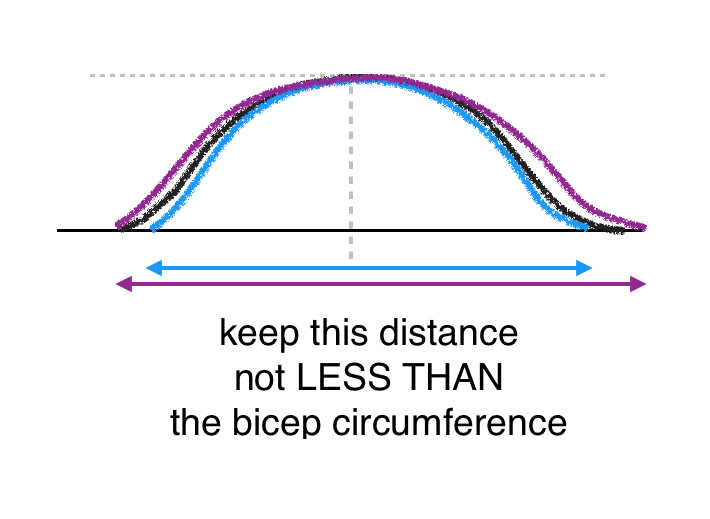 use a fixed sleeve cap height and vary the bicep width to get the 17" curved distance. Drafting resources often use the first approach because it's easy to teach diagrammatically. I often use the second approach when drafting for comfort (i.e. for kids), and a combination of the two when drafting for both aesthetics and movement. 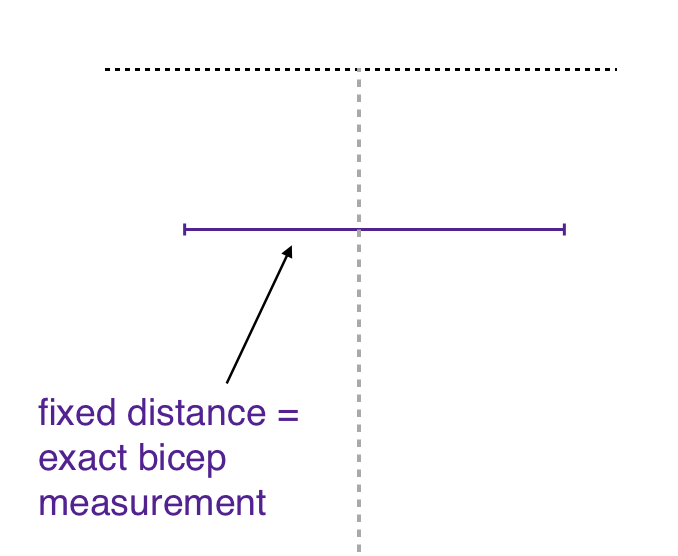 The important thing I keep in mind when using the variable-bicep-width approach then, is to ensure that at any time in the draft, the width of the sleeve cap should not be less than the bicep circumference we measured on the wearer. Why? So that the sleeve will be comfortable. It's common sense, and thus meaningful. 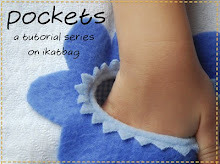 It's easier than you think, because the sleeve cap is so flat to begin with. But yes, even as I'm drawing and re-drawing my 3.5"-high curves to get them to match the 17" distance, I'm keeping that in mind. Here's a pictorial example of how I might use a combination of both approaches. Suppose I start by drawing the black sleeve cap below. It's 3.5" high but my first sketch turns out not to be 17" long as I'd hoped. In order for it to be 17" long, I'll need to either spread the end points much farther apart or space them much closer together. This changes the shape of the sleeve cap even as I'm keeping the 3.5" height constant. 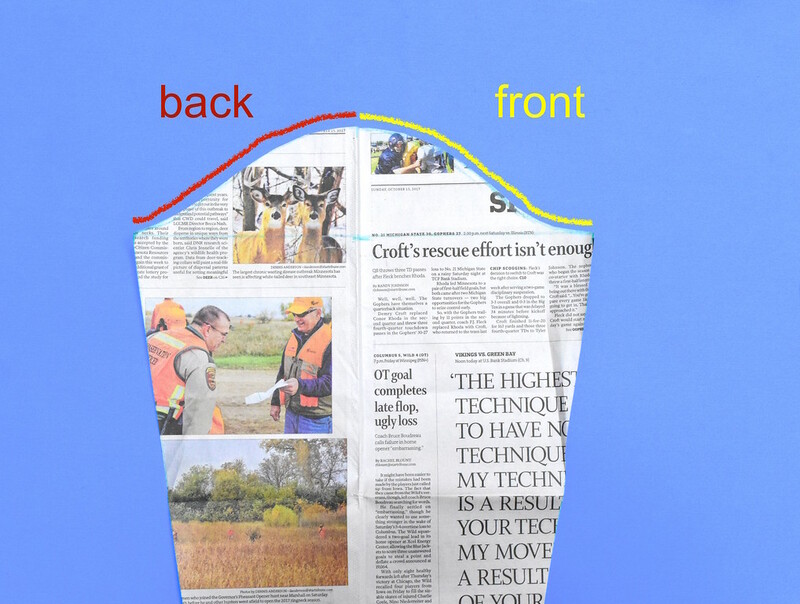 In my mind, I immediately visualize the angle of hang of the sleeves changing drastically (remember the newspaper drafts in the earlier visualization exercise? ), which is what I want to avoid. What I need to keep consistent is then the shape of the sleeve cap i.e. 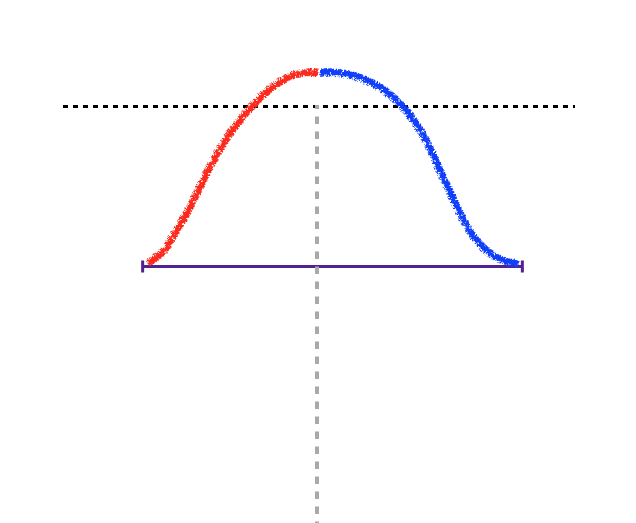 the gradients of the curves, even as I am increasing and decreasing their distances. Here is a diagram of how that might look. Notice that the height of the sleeve cap will need to change along with the widths in order to keep the 'mountains' looking the same. When set into their corresponding armholes, sleeves made from these three sleeve caps should now hang at the same angle. 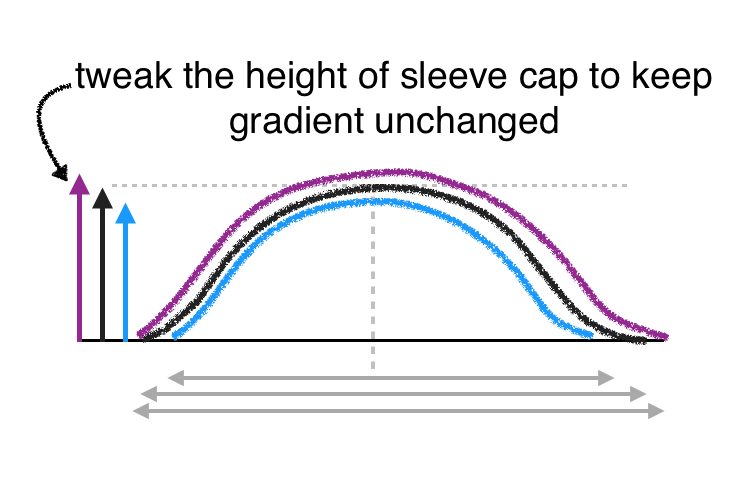 This is what I meant earlier when I described the drafting of a sleeve cap as a fluid juggling of interrelated factors: sleeve cap height, gradients of curves, horizontal width. They're choices I make and prioritize in turn, in order to achieve the outcome I want. 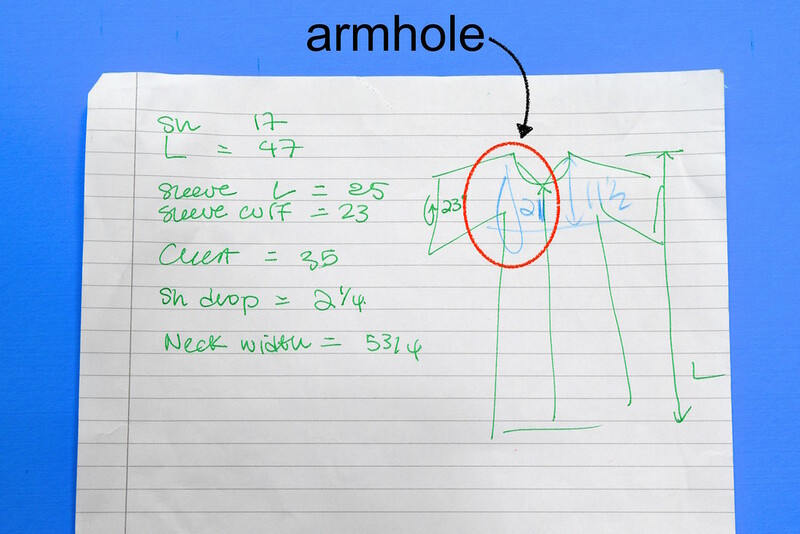 Well, friends, we've come to the end of another long drafting tutorial on sleeves and armholes. 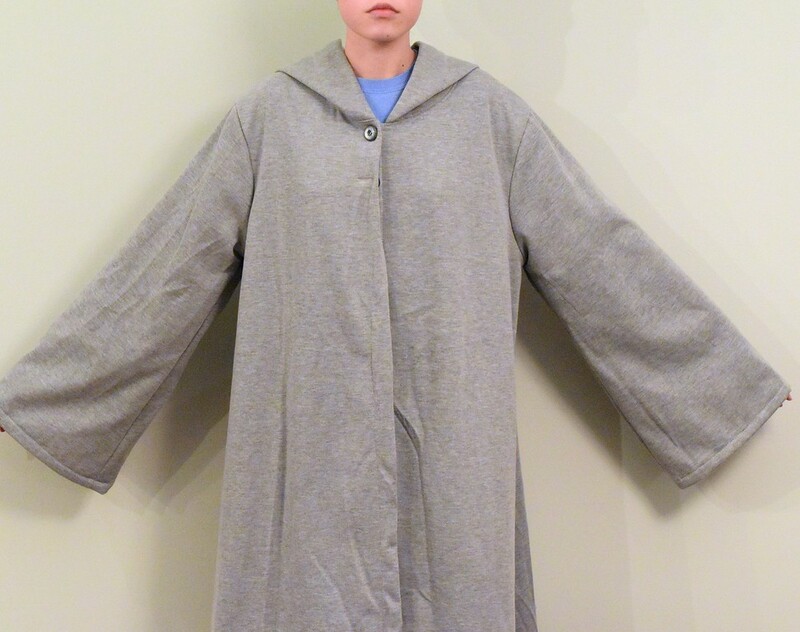 We began with Jenna's cardigan; here to end are some pictures of Emily's Moaning Myrtle robe. 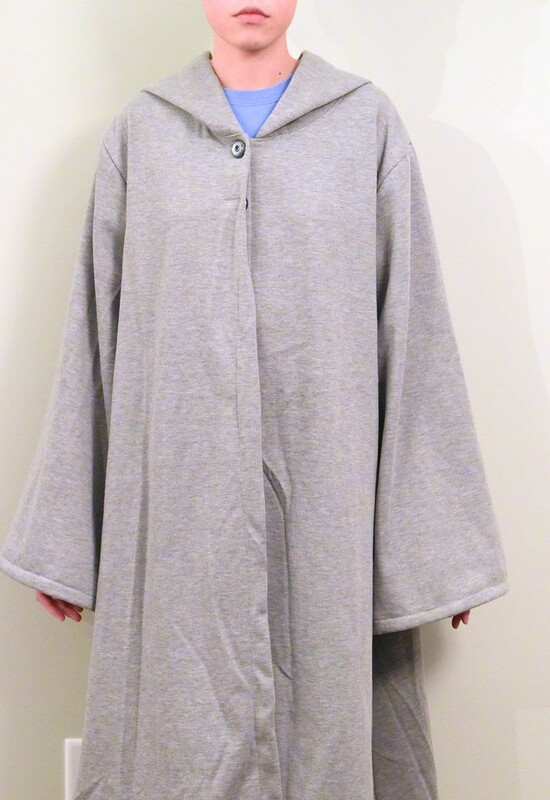 This one has a very different fit: flowy-flared, oversize, designed to accommodate many more layers underneath than Emily has on in the photo. How does one draft for variables like these? 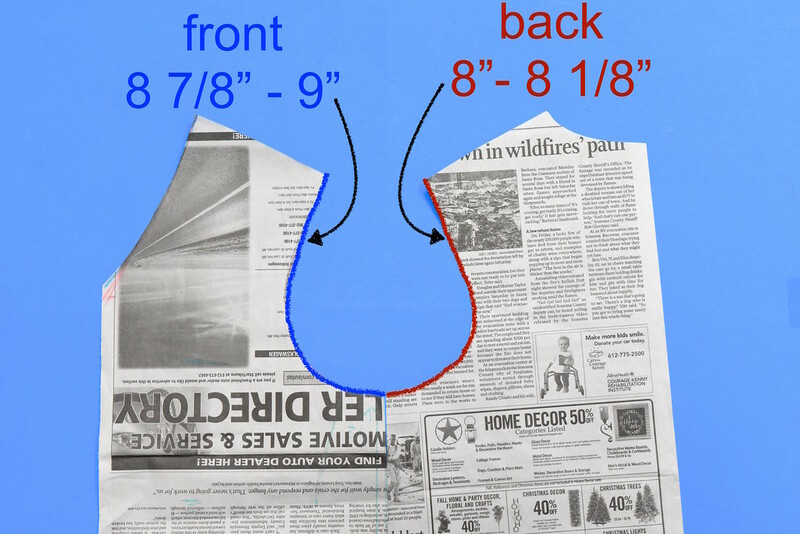 The sloper method, with its snug-fit requirements, would be impractical. There is so much to unpack in drafting, and this just brushes the surface. Beyond the shape and size of the sleeve cap in two dimensions are other features with which to further shape it in three dimensions: pleats, darts, gussets, for instance, which would then be incorporated into the style of the garment itself. 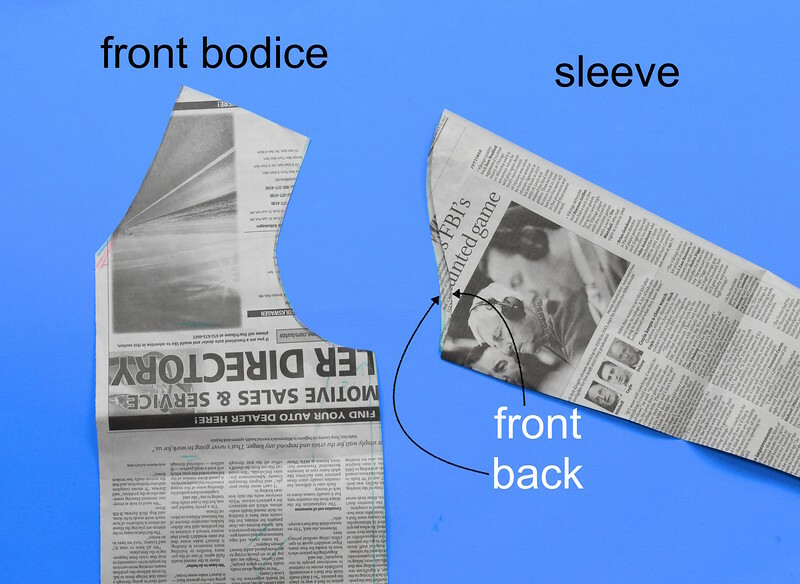 As I'd said in the first part of this tutorial, this isn't new stuff - people have been drafting all shapes and sizes of sleeve caps and armholes from the dawn of time. I'm hoping that this new way of looking at old information might help you understand not only why your drafts look the way they do, but that you have a lot more control in the process than you might imagine. Remember: it always begins with the question, "What exactly is the fit that I want on this body?" Ask it, then answer it in a way that is visually meaningful to you. 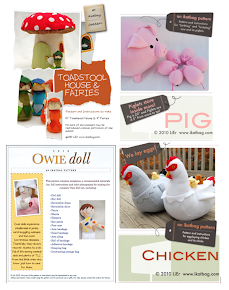 Now go forth and make beautiful (and comfortable) garments! Oh my goodness this is sooo helpful. I recently tried to draft a sleeve and it was so tight and uncomfortable I had to insert a diamond shaped gusset in the underarm. Next time, armed with this tutorial, I will do better!